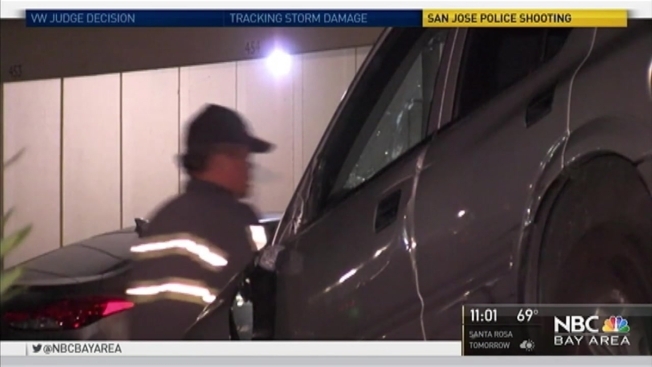 San Jose police officers opened fire early Tuesday on a suspect after a man in a stolen Isuzu SUV twice rammed an officer in a squad car near the Kellogg Co. plant. Despite that, there were no injuries during the midnight shooting that unfolded at the corner of Wooster and Tripp avenues. Lt. Greg Lombardo said three officers were on routine foot patrol at the end of Wooster just north of Tripp. As one of the officers was getting back into his patrol car, the silver SUV came around the corner and struck the police cruiser. The suspect vehicle then backed up and struck the patrol car again, Lombardo said. At this point, the other two officers that were still on foot began firing their service weapons at the suspect vehicle, Lombardo said. The driver then fled the scene and the SUV was discovered unoccupied about a half a mile away at McKee Road and El Rancho Verde Drive. Police searched the area near the vehicle and located a person officers think might be connected to the event. That person was taken into custody on an outstanding warrant, Lombardi said.